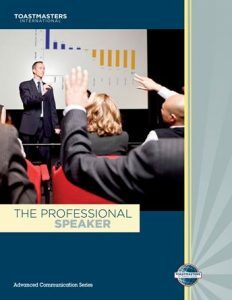 it’s not an unusual story for someone to join toastmasters just with the intention to improve their communication skills and to discover that they enjoy speaking in public so much that earning money as a professional speaker is very much within their grasp. This is the manual to help on that journey. Objectives:• Identify the basic differences between keynote speeches and other kinds of speeches.• Learn how to evaluate audience feeling and establish emotional rapport.• Learn and use the professional techniques necessary for a successful keynote presentation.• Develop a speech style and delivery that effectively inspires and moves the audience to adopt your views as a collective reaffirmation of its own. Objectives:• Entertain the audience through the use of humour drawn from personal experience and from other material that you have personalised.• Deliver the speech in a way that makes the humour effective.• Establish personal rapport with your audience for maximum impact. Objectives:• Tell a sales audience how to sell a product by using a planned presentation.• Inform a sales training audience about the human experience of the buyer-seller relationship.• Use entertaining stories and dynamic examples of sales situations.• Inspire salespeople to want to succeed in selling. Objectives:• Plan and present a seminar with specific learning objectives.• Relate to the audience by using a seminar presentation style.• Use seminar presentation techniques to promote group participation, learning and personal growth. Objectives:• Understand the concept and nature of motivational speaking.• Apply a four-step motivational method with the purpose of persuading and inspiring.• Deliver a motivational speech to persuade an audience to emotionally commit to an action.